Face-to-Face conversations are easier than ever with Interpretype's newest hardware platform. 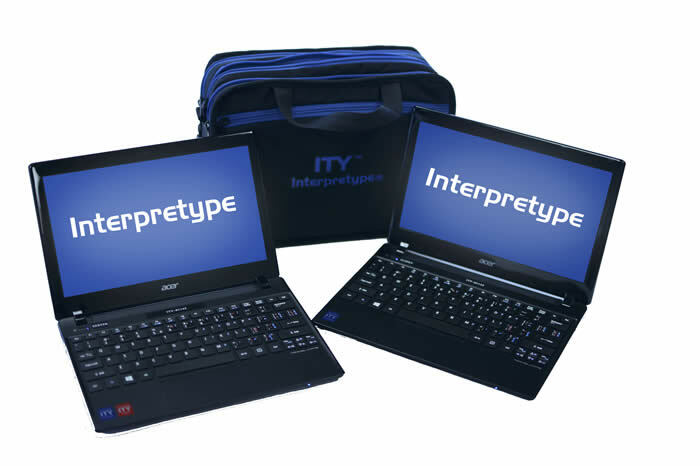 Interpretype computers feature 11.6 inch screens, Windows operating system and internal Bluetooth. Interpretype's Instant-connect software enables users to begin a face-to-face wireless conversation instantly, easily and accurately. Webcams are integral to every Interpretype C2.0 along with the software to enable a sign language video conversation anywhere in the world. And, by connecting to a Video Relay Service (VRS), call anyone on a cell phone or land line. Interpretype computers can be ordered with our Speech to Text option (STC2.0). Now voice recognition can be coupled with ITY Lecture Automation Mode for instant captioning and text streaming in educational environments. Interpretype's exclusive Language Translation Module (T2.0) adds the capability for translating text conversations between English speaking people, and people who speak French or Spanish....easily, accurately and confidentially. Interpretype C2.0....always affordable; easier to use, faster and more robust than ever.... the Industry Standard for conversations between Deaf and Hearing people.